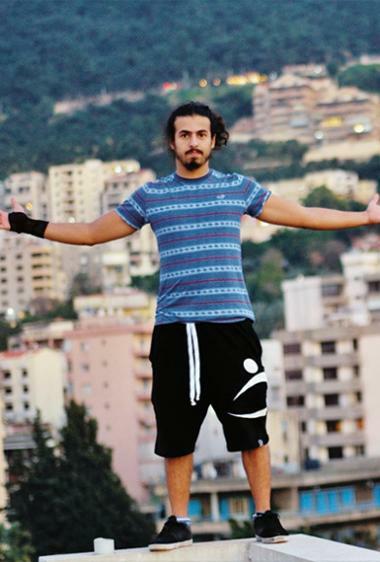 Iyad Al Mrouj is a leading light on the UAE freerunning (also known as parkour) scene. Here, the 22-year-old tells us about the importance of practice, what makes a great jump, and how he once landed on his face. How did you get into this, Iyad? I saw the movie B13, a French film famous for its parkour, and I loved the way the guy in it moved. I looked up what sport it was, found it was parkour and then looked on Google to see if anyone was doing it here in the UAE. And there was. That was seven years ago and I’ve being doing it ever since. I was definitely the new kid on the block for a while. I’d previously done some martial arts, but what I’d learned didn’t really transfer into parkour very well. When I first went to watch the guys training I was just amazed by how they were moving. I remember thinking they were like superheroes and they were doing it right in front of me. What are the first things a newcomer to freerunning learns? One is known as the precision jump, and that’s where you jump very precisely onto things, often a very small area. If you’re going to jump onto a ledge, for example, you need to know how to land accurately without falling off. Another move that is very important is called the lazy vault, which is one of the easiest parkour moves and is where you overcome an obstacle around waist height using only your hands. It’s called the lazy vault because it’s the easiest one to learn. Is this a sport that anybody can try? It can be dangerous just like any other sport, but if you take things gradually and don’t go for the extreme stuff it’s mostly OK. Some people do it for ego, just to prove something, and that’s when they get hurt. If you take your time and do small jumps hundreds of times and then move onto the next move, you should be pretty confident in your abilities. 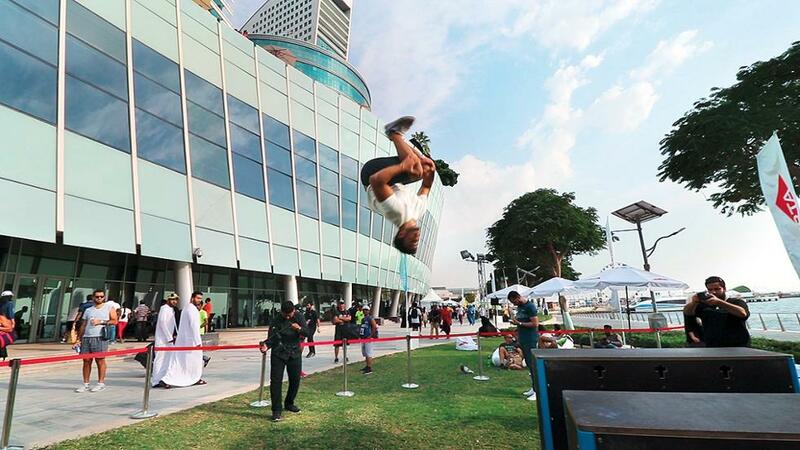 How popular is freerunning in the UAE? Not that popular, and it’s seasonal too because it’s just too hot in the summer. In the winter there’s a lot more people, maybe a few hundred. Parkour used to be all about jumping over things in the street – is it often done in gyms these days as well? Yes. Over the years many companies and gyms have been providing parkour coaching, which is great, because it means people have a safe place to learn the sport – but you really don’t need to go to the gym. I learned on the street with friends and like the social aspect of it. Where in the UAE do you try freerunning? The Jumeirah Beach Residence has some nice structures, although I’m not sure if it’s legal to train there. As I’m from Abu Dhabi, I like to train on the Abu Dhabi corniche. Do the police ever turn up and tell you to move on? Not the police, just security guards, but it’s not normally a problem. They just ask us to leave and we go on to somewhere else. Is it possible to earn a living out of parkour? I’ve done it professionally for a few years – although I am now moving away from it – and one way to make money is in stunt work for movies and commercials. They’ll need someone to jump over something and don’t want to risk the actor. The first time I did a job like this, when I was 15, I was hired to do a stunt for a commercial and it was a total failure. Mid-way into the project I fell on my face from a moving car. I did lose a bit of face skin, but luckily they put some make-up on me and I finished the job. The most common way to make money out of parkour is to coach, and I’ve done some of that, too. From how high can a human fall and still land safely if he knows how to do it? Even if you land well and don’t seem to have any injuries, you will still have done some damage to your body because you have ligaments and cartilage. You might not have broken a bone, but if you do a challenging jump over and over you’re going to wear out your body, and because of that I don’t like jumping off high places. It’s good to practise high jumps a few times just to learn how to do it in case you ever need to, but not repeatedly. I’d never really go over two metres, but it is different for everybody. What are some of the things about parkour that would surprise us? The amount of conditioning that we do and the amount of time we take to prep for a difficult jump would probably surprise people. They don’t see all the work behind the scenes. They might see a final jump, which is spectacular, but they don’t see the hours and days behind it. Finally – is it impossible for you to be passing through a city without planning a series of freerunning moves in your head?